The honest truth is that after working with the Ipswitch MOVEit solution as a technical consultant with a focus on security, I genuinely believe it is the best solution of the market. Now, it is not just my opinion but an opinion which is shared by the peers of those that I speak to and promote Ipswitch solutions to on a daily basis. The nine vendors evaluated received scores based on a total of 498 user reviews. According to Info-Tech, each product is compared with all other vendors in their category to create a holistic, unbiased view of the product landscape. Info-Tech also includes a scorecard for each product, which gives a more detailed look at each competitor. 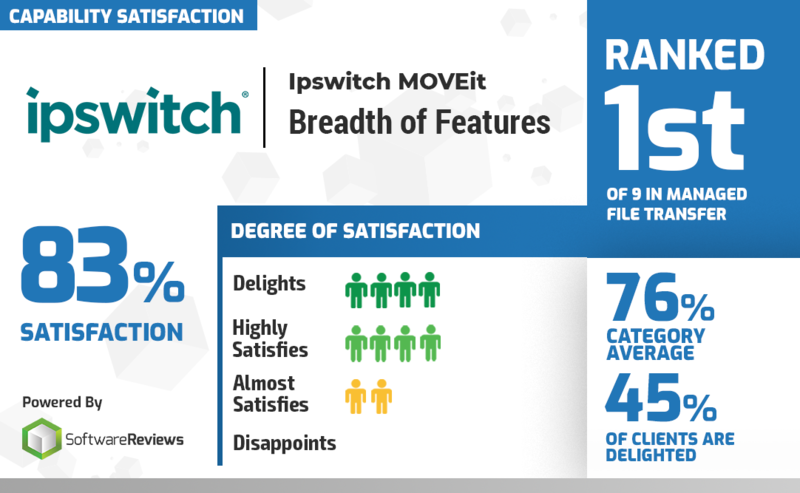 In particular it is vindicating to see that Ipswitch MOVEit is scored at 83% satisfaction for the breadth of features that MOVEit includes. Nearly 10% higher than its closest competitor at 76%. Not only were the breadth of features appreciated in high numbers, but those features scored an 82% satisfaction, with not a single disappointed vote. Quality of features is not always something which is easy to convey in a conversation, particularly when solutions are often primarily compared on price, with an assumption of all managed file transfer solutions being the same. This result proves that Ipswitch solution features are designed for real-world application; and are proven to solve real-world problems. Security is the core focus for Ipswitch MOVEit solutions, and that's why we are so pleased to learn that it also ranked first in feature evaluations for Authentication and Transport Security. With MOVEit, you can secure your critical data in transit and at rest with advanced security features and proven encryption (FIPS 140-2 validated AES-256 cryptography). You can also enforce user, system, and file security policies while controlling the movement of sensitive files. Leverage user authentication, delivery confirmation, non-repudiation and hardened platform configurations. Want to read the full report? Click here.